Domestic Apologist: Too good to give up. Nothing sparks a firestorm of comments like taking a hard line on an issue. Over at the National Catholic Register, columnist Danielle Bean did just that by outlining "Why I'm Giving Up Communion On the Tongue." Nearly 400 comments later, and Bean's column is the most-read page on the site this week. Bean's stance comes from a series of blunders by her parish's ill-trained Extrodinary Ministers of Holy Communion, who have, among other things, dropped the host on the floor while attempting to place it on her tongue. I could be stubborn and insist upon receiving on the tongue because I have a right to, even when the challenges it causes become a distraction to myself and others. But that doesn’t seem like something Christ would want me to do. And that is why I am 90% convinced that from now on, when I receive the Eucharist from an EMHC, I should put my own preferences aside and receive in the way that is least likely to cause confusion and distraction—in the hand. Blame could be passed around ad infinitum here--here are some general accusations: Blame the EMHCs, they don't know what they're doing. Blame the darn congregants that present themselves to receive on the tongue, but have their mouth partly open, or have their tongue down to their chin or who are 6'8". Blame the pastors, who haven't trained the EMHCs. Or, place additional blame on the pastors for having EMHCs in the first place. And round, and round. I received Our Lord by hand until fairly recently. Fear of looking stupid, I suppose, or of having the host drop to the floor (much like what Bean experienced) held me back from receiving on the tongue for years. But now that it's a regular practice for me, I know that it's too good to give up--it's a special moment of reverence between me and the Lord. 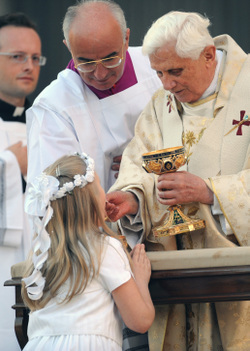 Someday, I hope to kneel when receiving as well, like Pope Benedict requests of recipients when he distributes Communion at papal Masses. Here's a little background: The United States is one of four countries that have been granted an exception from the universal practice of receiving Communion on the tongue. Pope Paul VI discussed the correct posture for the Eucharist in his 1969 Instruction on the Manner of Distributing Holy Communion, Memoriale Domini. After a survey of the world's bishops showed a majority preference for retaining the discipline of receiving on the tongue, Pope Paul expressed his support for their conclusion. He did, though, give a loophole. For places where receiving by hand was already the norm (or where there was a "particular circumstance"), the practice could be allowed. The United States became one big "particular circumstance," apparently, since receiving by hand here wasn't the norm in 1969. But I digress. "It could also be noted that the (Pope's) preference for such form of distribution which, without taking anything away from the other one, better highlights the truth of the real presence in the Eucharist, helps the devotion of the faithful, and introduces more easily to the sense of mystery. Aspects which, in our times, pastorally speaking, it is urgent to highlight and recover." The pope is, of course, right: Receiving on the tongue makes clear that we receive no less that the Body, Blood, Soul and Divinity of Jesus in the Eucharist. But I have many dear family members and friends that receive the Eucharist in the hand with equal reverence as I do, receiving on the tongue. If and when the Vatican announces that the U.S. faithful may no longer receive Communion by hand, I'd expect all Catholics to fall in line. Until then, reverence and the utmost respect for the Lord present in the Eucharist should be the uniform characteristics for those in the Communion line. O Jesus, meek and humble of heart, make my heart like yours! And just for fun... a little photo tutorial. Try attending the Traditional Latin Mass and avoiding the Novus Ordo where lay people distribute communion. Yes, the answer is simple.